Food made at a Guild winter party. In addition to the historical banquets we cook , the Guild also has a holiday party for ourselves every winter. 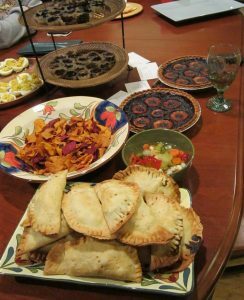 Held at a member’s home, we’ll enjoy good conversation and the fellowship of cooks and friends. Sometimes we spend the afternoon preparing modern food from some interesting cuisine, or food from an historical cuisine. Sometimes the holiday party is a potluck of side dishes, while we make a main dish for everyone to enjoy. Past menus have included a Tolkien-inspired menu, a Tapas Party, a Victorian Christmas dinner with an organic Prime Rib, Venetian Carnevale foods, and a wonderful Greek dinner including all our favorite Greek appetizers. 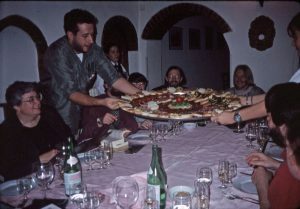 Guild members at Il Mulinaccio Ristorante near Florence, Italy, in 1995. In Autumn of 1995, thirteen members of the Guild had the grand adventure of renting a villa in Tuscany for two weeks. We toured around Florence and Tuscany, ate amazing food, drank a lot of cheap wine, and had a glorious time relaxing in the Italian sunshine. Since that date several of us have returned to Italy in smaller groups to continue our research and revisit the memories of that wonderful journey.